The Star SP700 has an impressive print speed, thanks to its bi-directional printing feature, and integrated Logic-Seeking for the optimisation of the printing process. Paper change is a breeze with its drop-in and print loading system, ideal also for less experienced users, and for preventing unwanted interruptions during busy times. This printer is optimal for applications calling for reliability and speed, whether in retail, production or hospitality. 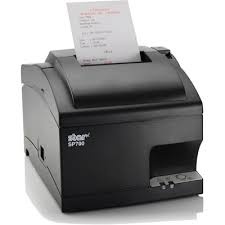 It can easily handle paper widths of 76, 70 or 58 mm, and prints receipts bi-directionally via 9-pin dot matrix at an amazing speed of up to 8.9 lines per second. Optionally, it can also print in two colours, to give you important marketing messages or texts, leaving a visual impact for later recognition. Its graphics download is integrated into the driver software, to better support this feature, ensuring for good administration of logos and coupons, without the need for additional software. Its splash-proof construction is the ideal choice for kitchen or bar usage. Plus, its integrated power supply and compact footprint 160x152x245 mm save you valuable working space. You can use this printer horizontally, upright, or even mount it on the wall optional. Also available is a model with an auto-cutter and/or journal take-up. The SP700 is intuitive and easy to use, giving you greater operational flexibility. In addition to being compatible with current Windows versions, it is also compatible with Windows Vista, Linux, JavaPOS, OPOS, Mac and ESC/POS. Its helpful software makes its integration easier for you, while giving you a wide spectrum of innovative applications a graphics management tool with name and list functions allows for the identification and usage of up to 255 pictures. Multiple printer configurations and a quick upload into any system are no longer an issue. Its logo-saving driver tool loads multiple pictures monochrome or multi-coloured in many formats. Plus, its virtual serial port emulator guarantees you can use the existing USB or Ethernet infrastructure without adaption to the existing software. For seamless integration of the SP700 into existing systems, you have at your disposal a serial, parallel or USB option to choose from, as well as a model without interfaces, for the option with Ethernet or Wi-Fi.